MTA Raises $355,680 In 24 Hours On Giving Day! MTA participated in Yeshiva University’s Giving Day on April 25th and raised $355,680 in 24 hours for its Scholarship Campaign. “We are truly inspired by the generosity of the MTA community, because of which, we will be able to provide a strong Torah and academic education for students who otherwise would not have access to the MTA experience,” said Head of School Rabbi Joshua Kahn. “We are incredibly proud of our talmidim, whose hard work and efforts contributed to the success of this campaign. 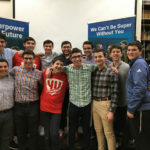 The achdus and energy were felt throughout our building, as our talmidim made calls and sent emails to family, friends, and alumni, asking for help in reaching our goal.” The Scholarship Campaign will culminate at MTA’s Yeshiva-Wide Seudas Preidah and Siyum on June 6th, paying tribute to Rabbi Hyman Arbesfeld (‘49).